Introducing the pureWash Pro Laundry System, a new and innovative way to clean and purify your family’s laundry. There is no getting around it. Laundry detergent is harsh – very harsh. Your laundry detergent contains toxic chemicals that jeopardizes the health and well-being of your family and the environment. What if you could use LESS detergent – a LOT LESS of it. Would you? And what if we told you your the laundry would actually be CLEANER if you used LESS Laundry? We’re here to tell you that there’s a healthier, safer and smarter way to do laundry the pureWash Pro Laundry System is revolutionizing the way you clean home laundry with its patented, ozone purification water process. The future of clean is here. I would recommend this product to anyone expecting good results and who wants to save time and money. The pureWash Pro Laundry System pays for itself. Fast. Click the Red Button Below to Buy Your pureWash Pro Now! SAVE MONEY and KILL GERMS! Click to Buy! Learn HOW the pureWash Pro Laundry System Works! 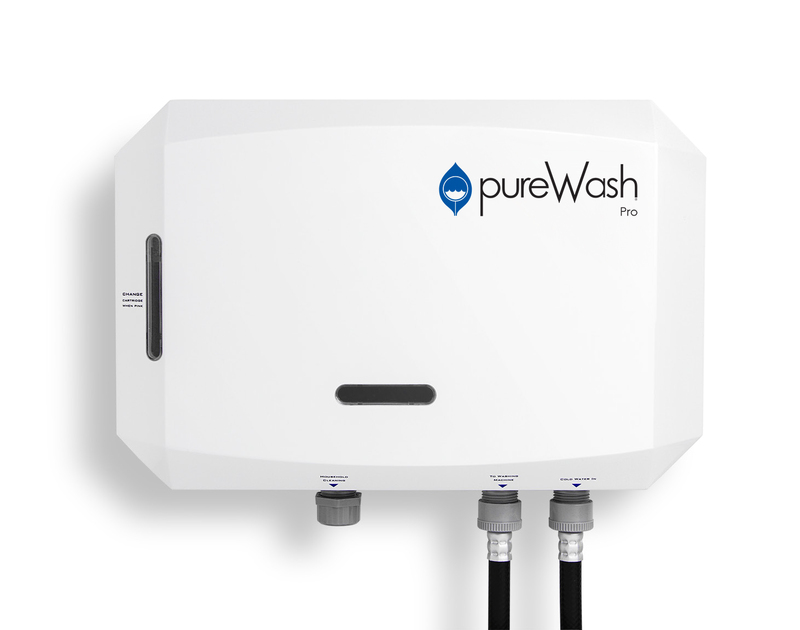 The pureWash Pro Laundry System, easily hooks into washing machine and harnesses the power of oxygen. The unit infuses 100% natural, safe activated oxygen (ozone) into the cold water of your washing machine. This oxidation process removes residue and cleans and disinfects your entire laundry with little to no detergent. The science behind this product is actually quite simple. Activated Oxygen (Ozone) contains an extra molecule of oxygen that acts as a SUPER disinfectant that is actually 3,000 times MORE reactive than chlorine bleach without the harshness! The ozone in cold water breaks down cell walls of micro-organisms and kills them over prolonged exposure. Hotels and hospitals have been using this technology to keep their linens sanitized and bacteria-free. The pureWash Pro Laundry System uses that same technology but it’s compact design makes ideal for your home. Although innovative and advanced, it is simple to use and even easier to install. Everything you need is shipped to you in a simple box. It’s a quick install – in 20 minutes or less! I was a little skeptical at first, I mean our laundry is “very soiled” to put it mildly. To put the system to the test I was asked to find some “really smelly” laundry. It only took ONE wash, and the laundry seriously smelled like they had come from the clothesline. I will recommend this product to other shelters and also to my friends and family. The pureWash Pro Laundry System - perfect for YOUR home! Eliminate 99.9% of Mold and Bacteria! Ever notice a smell from your front loading washer? Studies have shown that the pureWash Pro Laundry System kills 99.9% of both mold and bacteria with JUST cold water. Your laundry has never smelled better! Save BIG on Laundry Detergent! With the pureWash Pro Laundry System, you use dramatically LESS detergent to clean your clothes effectively. The power of natural oxygenated water sanitizes your laundry, and eliminates dirt, bacteria and mold better than detergent. Your laundry has never been clearer. Want to learn more? Call us at 928-855-4273.